Its that time where it's too rainy and windy to get outfit pictures outside in the only free time that I have, so I had to get creative. Well, I say creative, it's not really I just found a somewhat tidy, well-lit part of the house to get indoor pics! I have another piece to add to my growing faux fur collection now in the form of a vest/gilet which makes a nice contrast to the coats I own. 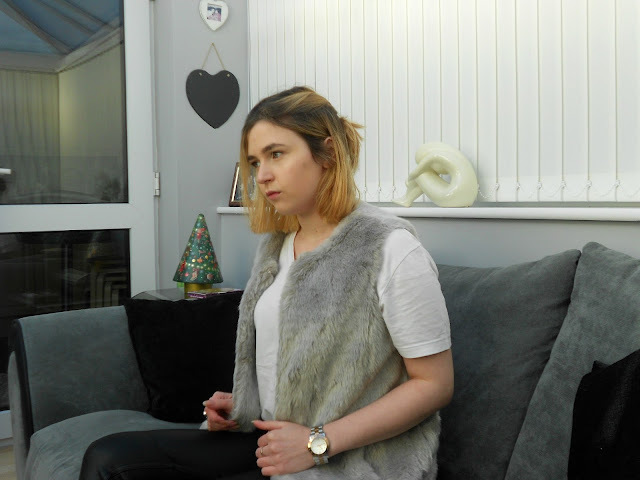 I originally wanted to get a fur vest in cream, but when I found this grey one I changed my mind. I thought it would go much better with more things in my wardrobe, being monochrome and all, and it's super soft material. Although I won't be fastening it up, it does have little hooks to make it possible, and it has pockets which are just the right size. I also like the high round neck style of the neckline, and the length is the perfect not cropped/not too long fit. I went for another monochrome look (surprise, surprise) and put on the faux leather pants I had on in my last outfit post too for a bit of a fur/leather texture clash! They're proving super versatile and I love the look of them with some platform boots. I kept thing somewhat simple with a basic white v-neck! Are you liking the fur vest trend?